Scorpion fish inhabits the southing coast of Hokkaido. There are many names for scorpion fish in Japanese depending on the region including kasago. It appears to be boney. That would make it look difficult to eat. 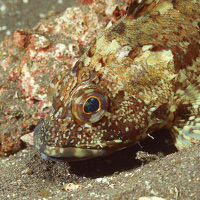 However, for the most part scorpion fish is edible with the exception of its innards. It is eaten as sashimi or in miso soup. The calories in Scorpion Fish per 140g(1fish small edible part) is 119 calories. Scorpion Fish is calculated to be 85Cal per 100 grams making 80Cal equivalent to 94.12g with 27.02g of mostly protein、0.42g of fat、0.14g of carbohydrates in 140g while being rich in vitamins and minerals such as Vitamin B12 and Vitamin D.